risk avoidance: this means identifying a particular risk, and choosing no longer perform the actions that invite such a risk. By avoiding risky behavior, in other words, the risk incurred thereby is also avoided. 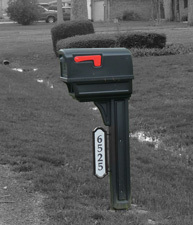 risk deterrence: this means responding to the threat of some particular risk by providing deterrent means or messages to let potential malefactors know that if they seek to inflict certain types of attack or damage, you have means to detect and respond to such behavior (Dulaney uses the example of a security camera with a promise to prosecute trespassers). risk mitigation: this means taking steps to reduce the risk, often by increasing the strength of defenses against them. risk transference: this means offloading some or all of a risk to a third party, many times by purchasing insurance to protect against loss (which also usually requires insureds to take reasonable steps for deterrence and mitigation as well, to qualify for further loss protection). The best thing about the article is Dulaney’s simple, effective, visual illustrations of these principles, and his use of a neighborhood mailbox to explain each of these principles directly and cogently. Well worth checking out, and even pondering for those who may never wish to pursue the Security+ exam. A nice piece of work!